Swedbank's customers can also donate their Rewards Points to the organizations, by choosing one of the four groups. This organization is part of group "Animals and nature". The project NGO Loomus titled "I Am on Side of Animals" raises people's awareness about the situation of the animals used in fur industry, agriculture, entertainment and for laboratory testing. As a result of our daily activities the real situation of animals is seen more clearly in society; people's consumption choices change over time; Estonian legislation becomes more specific and animal-friendly; Estonian cultural attitude toward animals becomes a subject of debate, and modern ethical streams of thought will meet a wider audience. Loomus is the first Estonian organization active in the field of animal custody, and which has been created by experienced animal welfare experts. Your contributions make it possible to provide information materials, pay for administrative costs, legal or other expert costs, create IT solutions and organise various events (e.g. information stands, seminars, courses, charity concerts). 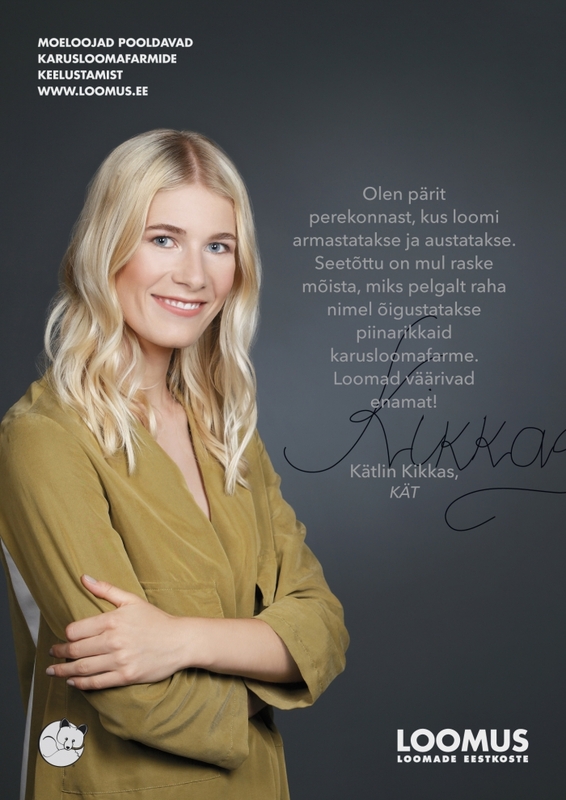 For the first time in Estonia, local fashion designers stand up to support a ban on fur farms in a campaign run by the animal advocacy organization Loomus. 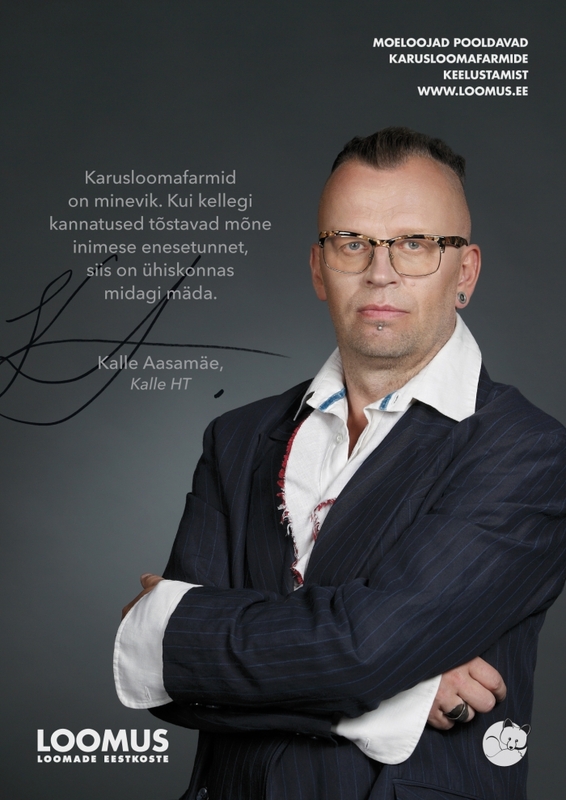 This project is a part of the long-term campaign “I am on the side of animals!”, which supports the ambition to submit a bill to the parliament that would ban fur farming in Estonia. The campaign includes fashion designers Reet Aus, Margaret Kodusaar, Kalle Aasamäe, Kätlin Kikkas, Perit Muuga, Marilin Sikkal, Tiiu Roosma and Kadri Vahe. The author of the photos is Juta Kübarsepp, designs are made by Tõnis Aaliste. All the fashion designers, who stood up in the campaign, also joined the international Fur Free Retailer program, in which the participating designers, fashion houses, clothing chains and stores do not produce or sell products made of real fur. By establishing fur free principles, the Estonian fashion designers join famous high-end brands and store chains such as Armani, Hugo Boss, Tommy Hilfiger, Calvin Klein, Stella McCartney, H&M, Esprit, Lindex, Etnies, O’Neill and others. Altogether about 300 companies across the world have joined the program. In 2014, a national petition to ban fur farms in Estonia gathered more than 10,000 signatures from the citizens of Estonia. 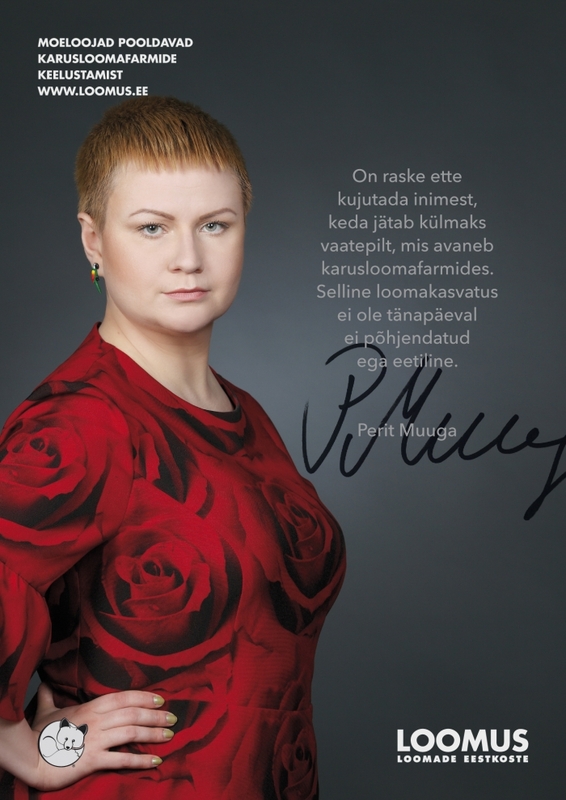 At the end of 2014, Loomus took the signatures and the corresponding memorandum to Riigikogu, the parliament of Estonia. After numerous public discussions and analyses, the Rural Affairs Committee that was supposed to decide the fate of fur farms in September this year, has decided to postpone the decision and ask for an opinion from the government of Estonia. An international petition to ban fur farms in Estonia has already gathered more than 28,000 signatures (https://www.change.org/p/parliament-of-estonia-end-fur-farming-in-estonia). Today, fur farming is banned in the United Kingdom, Austria, Croatia, the Netherlands, Slovenia and Bulgaria. Fur farming is partially banned in Denmark, Switzerland, Sweden, Italy and New Zealand. According to a survey conducted by TNS Emor, 58% of the Estonian population do not support fur farming. NGO Loomus is an organization, which is active in a field of animal custudy and guardi-anship. Animal guardianship means the protection of natural interests and rights of every animal and their representation in public debates.